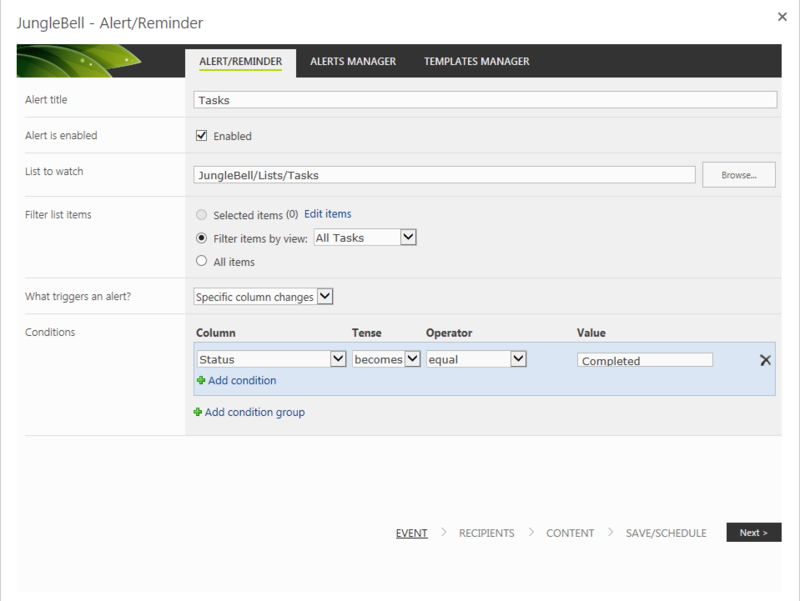 In JungleBell you can easily create alerts for items in your SharePoint. You can use JungleBell to be reminded when you have a meeting coming up, or if a certain license or contract is expiring soon. The configuration options are endless! 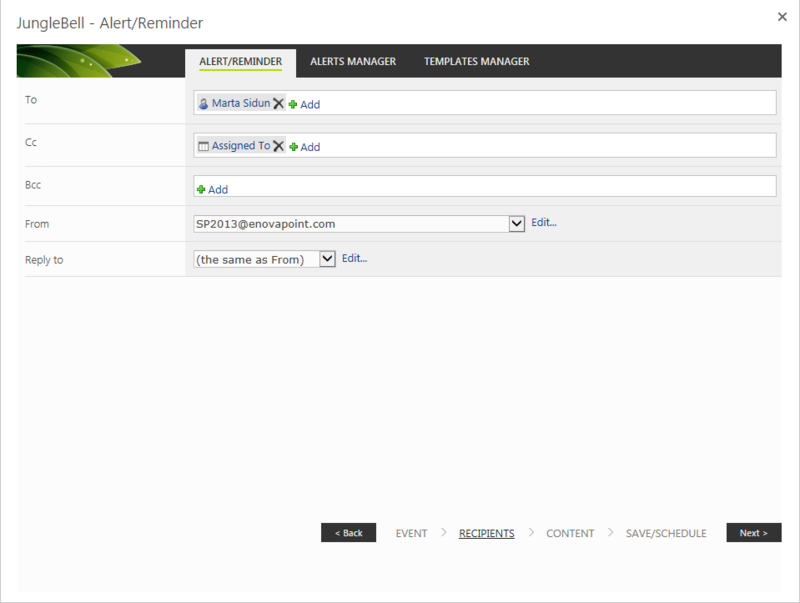 In this tutorial you will learn how you can start creating alerts in JungleBell. One of the simplest ways to create a JungleBell alert is through the main JungleBell dialogue. Let's get started. Navigate to the source list. Select items to be used for alerting or do not select any items if you want to use all items. Click the JungleBell button in the ribbon. The alert editing dialog will show up. Provide additional conditions in the Conditions section. Once you have done this select the Next button or the Recipients to proceed. 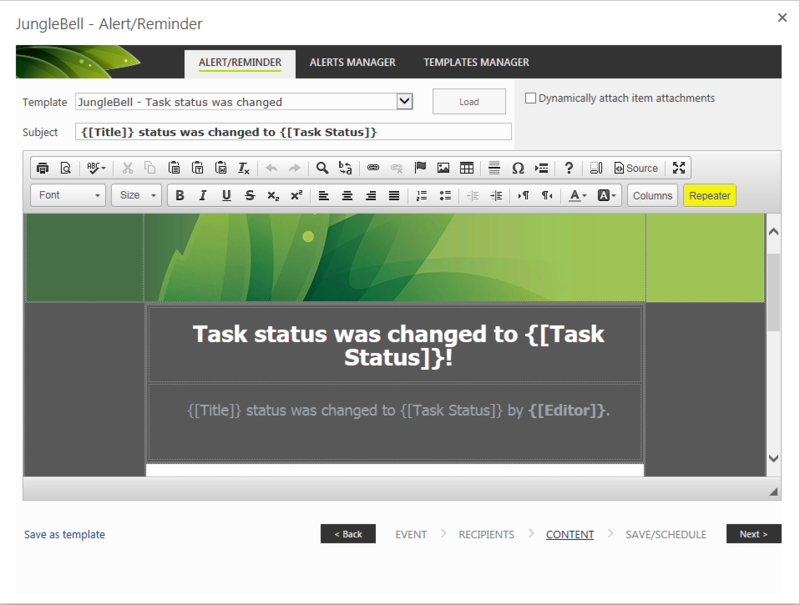 Specify recipients that should receive the alert emails. Click the Next button or the Content link to proceed. Enter an alert email subject. 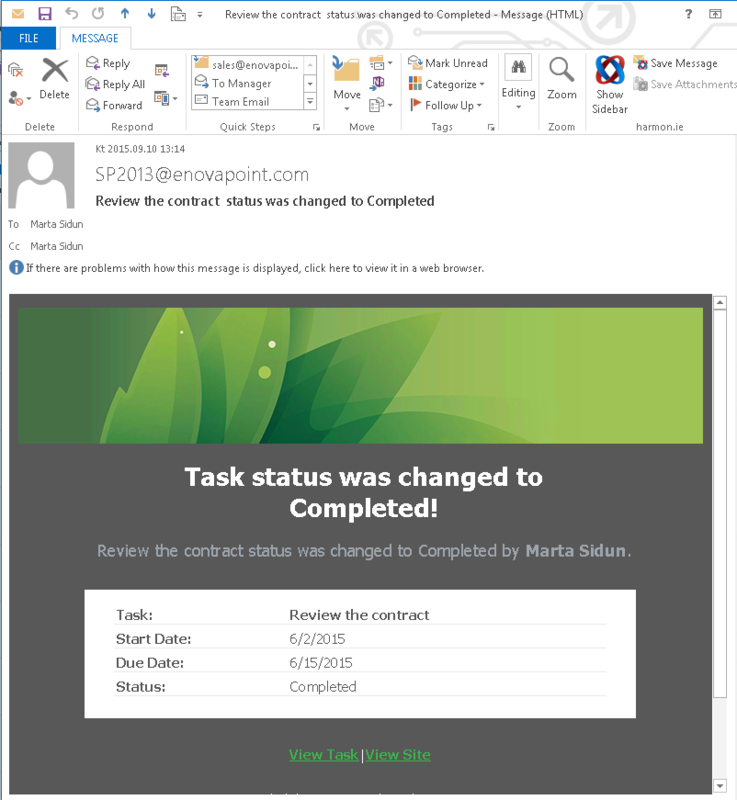 Write the email message or simply select one of the predefined templates. You can insert field values from a source list item by using the Columns button in the message editor. You can also insert a Repeater section if you want to combine multiple messages for this alert. Click the Next button or the Schedule link to proceed. 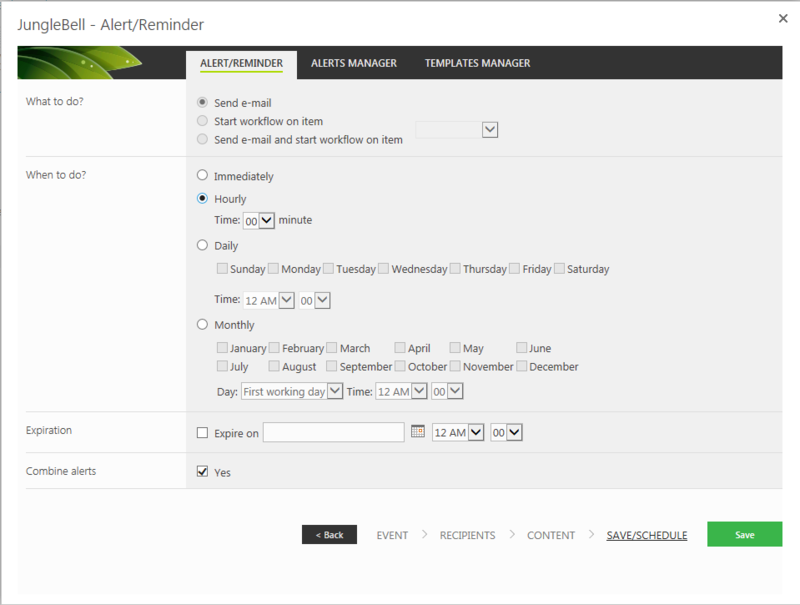 Now configure when to send your email alerts by selecting one of the following options: Immediately, Hourly, Daily or Monthly. You can also specific the specific time. 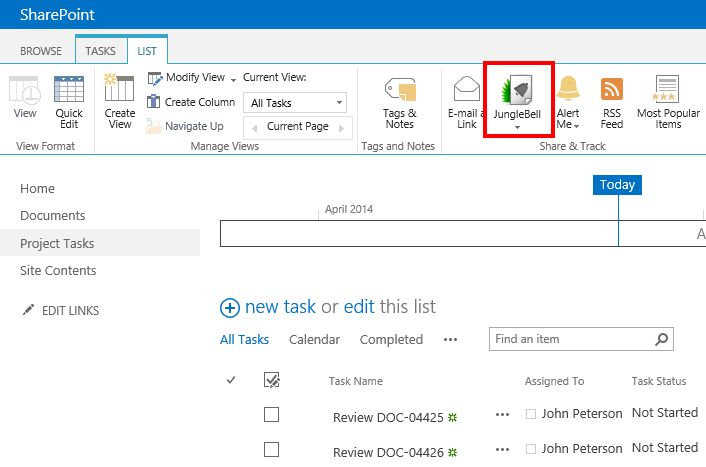 On top of that you have the option to specify the expiration date and time for your alerts. Check Combine alerts if you want to receive combined alert emails. A new JungleBell alert will be created and the dialog will be closed. Now, when a trigger event takes place, recipients will receive an alert email. Note: The JungleBell alert will remain accessible through the JungleBell Manager. This means you can come back and edit the alert at a later time.